Is Mister Rogers a Bisexual Icon? "...I have found women attractive, and I have found men attractive." It's no surprise that Fred Rogers (know to most as simply Mister Rogers) is one of the most beloved people in modern history—but did you also know that the late children's television icon may have also been part of the LGBTQ community? 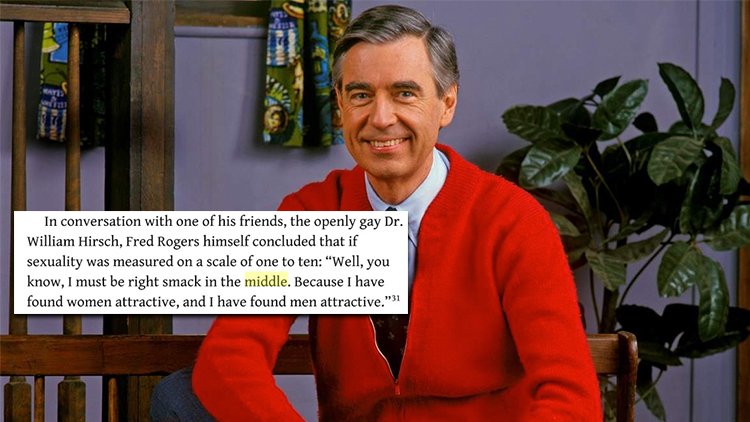 In a recent Twitter thread, YouTuber Cece Ewing talked about a recent conversation she had with her grandmother about how the Mister Rogers' Neighborhood host was, in fact, bisexual. Another Twitter user, Gabriel Lunesce, then cited an exerpt from The Good Neighbor, a biography about Rogers by author Maxwell King, where Rogers himself talked about his sexuality and being attracted to both men and women.